By 1850, King Kauikeaouli (Kamehameha III) had granted many concessions to foreign interests. Foreigners had served as advisors to Kings as far back as the first Kamehameha, but now they could also be members of the new legislature, which combined British parliamentary and U.S. congressional features. And in 1850 foreigners were allowed to buy land for the first time, a privilege they had been seeking for many years. The whaling industry, which had been going strong for several decades, hit its height in the 1850s. But then oil was discovered in Pennsylvania, leading to the development of kerosene. Other synthetic substitutes also appeared on the market and the demand for whale oil dropped dramatically. It was around this time that sugar plantations began to thrive, however. The California gold rush of 1848 had boosted the need for sugar. Since the Hawaiian ali'i had little interest in farming for exports, the sugar industry was dominated by foreigners. Five major companies shared many of the same members on their various Boards of Directors, creating a virtual monopoly on the island. Not only did these companies, commonly referred to as the Big Five, acquire many of the plantations, they also held shipping and banking interests. Native Hawaiians were the first to do much of the work on the sugar plantations. However, they preferred their traditional lifestyle of subsistence farming, a style which enabled them to meet their own needs without sacrificing all of their time to working in the fields. Soon, the needs of the plantation outgrew the local population and in order to meet their labor needs plantations began importing Chinese workers in 1852. The Chinese signed five-year contracts to work the land but, like the Hawaiians, they quickly found that they didn't enjoy plantation life. Most saved their money so they could return to China and establish good lives for themselves, but a few moved to the nearby cities and opened their own businesses. King Kauikeaouli died in 1854, passing the throne to an adopted relative, Alexander Liholiho (Kamehameha IV). The new King and his wife, Queen Emma, loved British culture so much they tried to establish the Anglican church as Hawaii's main religion. With Congregationalism already firmly entrenched, however, their attempt failed. The royal couple had more success with a jewelry style they created. Consisting of Old English letters combined with Hawaiian floral patterns engraved in gold and silver, the Hawaiian Heritage style is still popular today. Although Britain could have capitalized on Alexander Liholiho's Anglophilia, they didn't seize the opportunity to strengthen ties between the countries. But that didn't stop American advisors from warning about a British threat to Hawaii's independence. They tried to use this supposed threat to increase bonds with the United States. The U.S. Civil War began in 1861, cutting off the North from the South's sugar supply. Demand for Hawaiian sugar rose, increasing trade between Hawaii and the United States. But while the sugar industry continued growing strong, Alexander Liholiho suffered from health problems. At only twenty-nine years of age, he died. His brother, Lot (Kamehameha V), became King upon his death in 1863. When Lot inherited the Kingdom, discord split the legislature. The Hawaiian members refused to speak English, even though they knew it fluently. Meanwhile, the foreign members wouldn't learn Hawaiian. This division served Lot well, since he was a forceful man who wanted to restore the monarchy's power. His solution was to create a new Constitution which gave him much more control and lessened the Legislature's power. However, he understood and acknowledged the need to retain favorable conditions for business interests. In 1868, about 150 Japanese workers arrived for contract work on the sugar plantations. Poor treatment prompted an agreement in 1870 that allowed them to return to Japan early. Only forty of the workers actually left at this time, but the negative view of work conditions in Hawaii discouraged many other Japanese from pursuing contract labor. Poor health plagued King Lot, who died on his fortieth birthday in 1872. 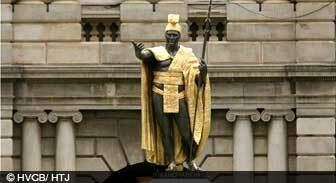 A life-long bachelor, he was the last of Kamehameha's line and left no heir to assume power. With no clear-cut successor, the Legislature chose Prince William Lunalilo as the next monarch. A favorite of the commoners, Lunalilo was known for his personal charm. His love of parties and reported alcoholism prompted opponents to call him "Whiskey Bill." He appointed Americans to three of four Cabinet positions, but his reign had little long-lasting influence, since he died after less than two years as King. After some debate, the Legislature gave the reign to David Kal'kaua. Among supporters of Kal'kaua's chief rival, Queen Emma, it wasn't a popular decision. They rioted, and the British marines were called in to restore order. Once the situation had been resolved, King Kal'kaua proved himself a worthy ruler to the Hawaiian people. Like several kings before him, he strove to elevate the monarchy and re-establish Hawaiian culture. He revived a number of traditional Hawaiian arts, including one of today's most well-known traditions, the hula dance. To raise the monarchy's status, he built a grand palace. Unlike previous Hawaiian royalty, he was a sophisticated, worldly man who easily fit in with international royals and political figures. He used his extensive travels to increase overseas knowledge of Hawaii. Of course, the United States was especially receptive to his visits. Although Kal'kaua considered the sugar industry a threat to his power, his tastes for life's finer things required him to maintain good will with big business. He signed the American Reciprocity Act of 1874, granting the United States the use of Pearl Harbor as a naval base in exchange for duty-free sugar imports from Hawaii. With no more tax on Hawaiian sugar, its price in the United States became very competitive. Increased demand called again for increased supply. Although plantation workers were still being imported from China, whites were concerned because the Chinese population had grown to outnumber them. Plantation owners tried bringing in European workers, but most of them demanded better pay and working conditions. Only the Portuguese, who began coming in 1878, were willing to put up with the plantation system. Planters paid them more than other workers and often made them overseers. Overcrowding in Japan led the Japanese government to begin encouraging emigration to Hawaii in 1886. Many lower class Japanese signed on to plantation work. The new flood of Japanese workers was more to the planters' liking than the earlier group. They were obedient, hard workers, and caused few problems. Most Japanese workers were men, who planned to save up money and then return to Japan. As they realized the financial benefits of staying, many remained in Hawaii after their contracts were up. Some recruited brides from Japan, while others married women from Hawaii's increasingly diverse ethnic population. With the mix of nationalities on the plantations, a pidgin language evolved. In spite of political concessions Kal'kaua had made in the sugar industry's favor, the increasingly powerful men behind it wanted to overthrow the monarchy. A group of them formed a secret society, the Hawaiian League. They drafted a new Constitution in 1887, reducing him to a figurehead and placing the power in the Cabinet's hands. The document also allowed Americans and Europeans to vote and instituted land owning and income requirements. Since foreigners now owned 80% of the land, Asian citizens and two-thirds of native Hawaiians would no longer be allowed to vote. Constitution in hand, the Hawaiian League ascended on the royal palace. After some arguing, Kal'kaua was forced (some say at gunpoint) to sign the document. Hawaiians called it the "Bayonet Constitution," and the resentment they bore toward the foreigners usurping their country amplified. By the time Kal'kaua died during an 1891 trip to San Francisco, tensions had greatly escalated. Kal'kaua's sister, Liliuokalani, assumed the crown with even more desire to oust the interlopers than he had felt.